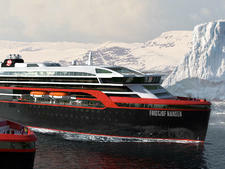 Named after a famous Norwegian polar explorer, Roald Amundsen will be the first of two new 530-passenger expedition cruise ships in Hurtigruten's Explorer Class of ships. 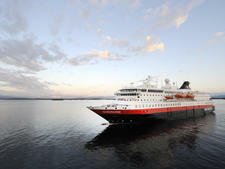 Purpose-built to sail in Antarctic and polar waters, Explorer Class ships will feature environmentally-friendly, electric hybrid engines, the first time a cruise line has employed such technology. It was scheduled to launch July 2018, but due to complications with the build, it has been put back until May 2019. 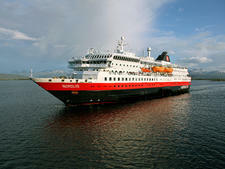 A second, MS Fridtjof Nansen, is scheduled to launch later in 2019, but it is not clear when. 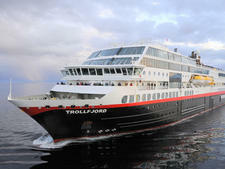 The ship will have 265 cabins; all will offer outside views and 50 percent will have balconies. Spread over nine decks, cabins come in three categories -- Polar, Arctic Superior and Expedition Suites -- and sleep up to four passengers. 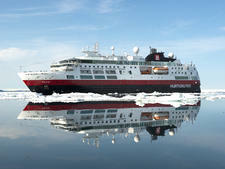 All cabins have a TV and Arctic Superior staterooms include tea and coffee making facilities. Amenities in the Expedition Suites include a sofa and sitting area, mini-bar, coffee machines and bathrobes, and aft suites have private outdoor whirlpools. Perks for Arctic Superior and suite passengers include room service -- subject to an extra charge -- plus complimentary continental breakfast in suites. Inside, cruisers will find a modern, but simple Nordic design showcasing natural materials, such as granite, oak, birch and wool. 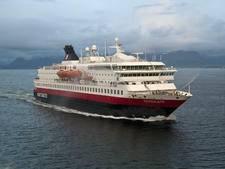 Roald Amundsen has three restaurants -- the main dining room, T. Aune, and the Fredheim restaurant, both situated on Deck 6, with the Lindstrom restaurant on Deck 9. Menus will be planned around local and seasonal ingredients. Tea and coffee is complimentary throughout the day, along with still and sparkling water at breakfast, lunch and dinner. The ship’s main feature will be the two-level indoor/outdoor Observation Deck wrapped around the top of its bow. 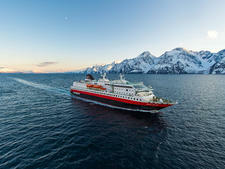 In the area behind it you’ll find the core of the onboard experience: the Amundsen Science Center. The center will have state of the art technology and gadgets such as touch screens and science equipment. The venue will also feature lecture spaces, a small library, and specialty areas for workshops in photography, biology, and more. 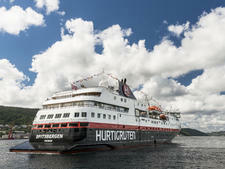 It will also be the onboard HQ for Hurtigruten’s 10-strong Expedition Team, which will be on every Expedition cruise. 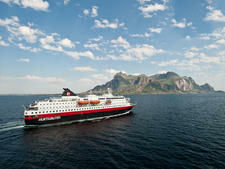 Other amenities include a gym and wellness center, with a sauna with oversized window for watching the scenery outside. The outer decks include a pool deck with an infinity pool, two Jacuzzis and pool bar. There is also a walking track, massage room, library and lecture rooms. 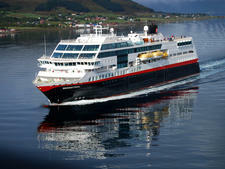 There is an elevator to all passenger decks, and wheelchair passengers can be accommodated on voyages that do not require embarkation or disembarkation by tender. Children under the age of five are not allowed on cruises to Antarctica; however, there is no age restriction to other destinations. 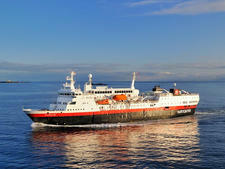 The ship will have a small medical center with an English-speaking doctor and nurse onboard at all times. Other facilities will include a self-service passenger laundry, plus laundry service at additional cost. With an emphasis on discovery expeditions, the entertainment is low-key. 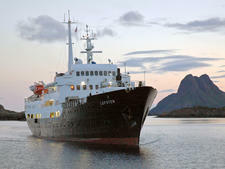 Passengers can expect presentations, lectures and meetings with members of the expedition team and workshops during the day, with musical entertainment on some evenings. In terms of expedition equipment, expect the very latest gadgets including a fleet of Blueye underwater drones which passengers can use to explore underwater; kayaks and large inflatable Zodiacs. 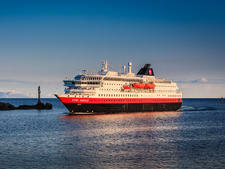 With its hybrid engines, Roald Amundsen is set to reduce fuel consumption by approximately 20 percent, and will be able to sail with solely electric propulsion for up to 30 minutes, to allow for absolutely silent cruising in areas passengers might want to hear icebergs calving or sea animals calling out. 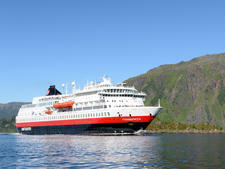 The ship will also feature an extra backup engine and 100 percent redundancy on all essential systems. Roald Amundsen will have a polar ice rating of six (allowing it to sail in polar waters in summer and autumn only) and its maiden season will feature 18- to 20-day voyages to Antarctica and the Chilean fjords.